Will Buckingham travelled to the Tanimbar Islands in Indonesia as a trainee anthropologist to meet three remarkable sculptors: the disabled Matias Fatruan; the buffalo hunter Abraham Amwelwatin; and Damianus Masele, who was skilled in black magic, but who abstained out of Christian principle. Part memoir, part travel writing, Stealing with the Eyes is the story of these men, and also of how stumbling into a world of witchcraft, sickness and fever led Buckingham to question the validity of his anthropological studies, and eventually to abandon them for good. Through his encounters with these remarkable craftsmen, and through weaving together Tanimbarese history, myth and philosophy from ancient times, Buckingham shows us the forces at play in all of our lives: the struggle between the powerful and the powerless; the tension between the past and the future; and how to make sense of a world that is in constant flux. Will Buckingham is a writer of fiction and non-fiction for adults and children. He is currently a reader in Writing and Creativity at the Faculty of Humanities at De Montfort University in the UK. He is the author of Sixty- Four Chance Pieces and Lucy and the Rocket Dog. Visit Will’s website here. Read Will Buckingham’s interviews for Southeast Asia Globe and OutsideLeft Magazine. 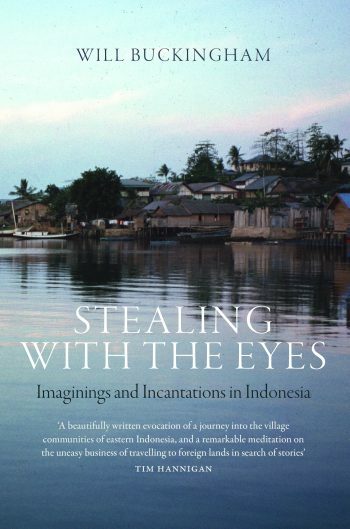 An excerpt from Stealing With the Eyes is available on Asian Review of Books.